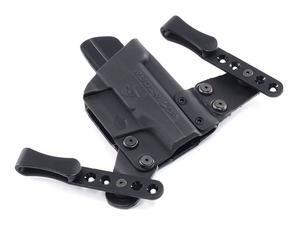 The holster attaches to the belt by two clips mounted to leather tabs on either side of the holster. These mounting clips distribute the weight of the loaded pistol while holding securely to the belt. A shirt may be tucked in over the gun and holster complete concealment.